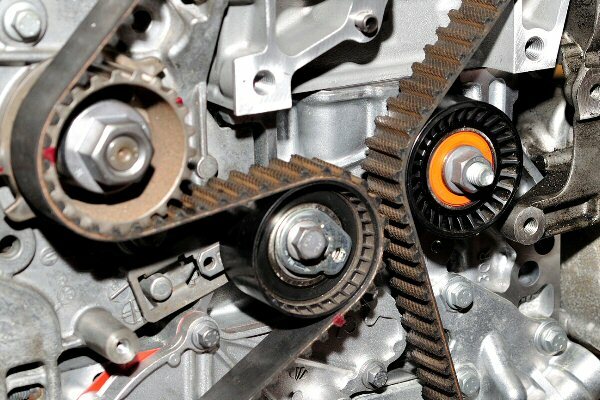 The main function of your vehicle’s timing belt is to connect the crankshaft to the camshaft. The crankshaft and the camshaft controls the engine’s pistons and valves, the timing belt helps to control the timing of these components ensuring the engine is performing at optimal levels. A broken timing belt can cause major engine damage, it is crucial to keep your timing belt changed. You can’t visibly see the timing belt so signs to look for are a ticking noise coming from the engine, the engine misfires, oil leaking from the front of the motor and the engine won’t turn over (this one is the worst case scenario). We can determine what the issue is and if your timing belt needs to be replaced, this is one thing you don’t want to let go past the manufacturer’s suggest schedule for changing because of the damage it can cause if it breaks, we can let you know how often your car should have the timing belt changed.